WOW! This was a long Winter up here in Boston! The thought of Spring and Summer is so exciting! But putting away the hats, coats and sweaters can be a real pain. I have a small closet, and it is difficult to see my clothes and to get them organized. Just a couple of purchases to help reorganize my room makes me feel prepared for the much anticipated warm weather! I got this portable closet rack at Home Goods to help me see my clothes as well as to help me figure out what new clothes I may need. Shoes and scarves get lost in my closet, so these containers help me to see them and wear them more often. A necklace or a fun bright bracelet can really help an outfit. 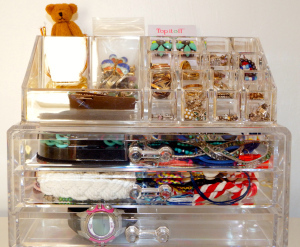 These organizers from Home Goods look nice on my bureau and make me wear my jewelry more often! A couple of new nail polishes, and I'm all set for summer fun in the sun!